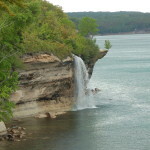 Michigan’s Pictured Rocks National Lakeshore is known nationwide for its beautiful Lake Superior shoreline, towering cliffs and plentiful waterfalls. 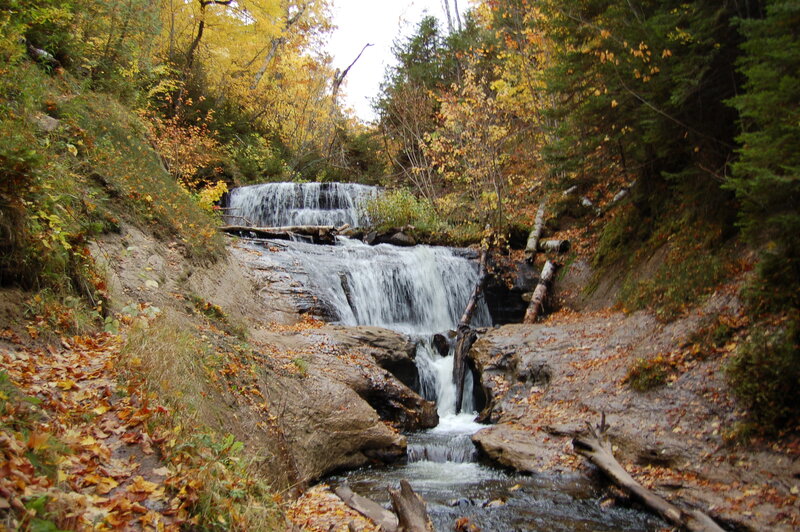 While many of the park’s waterfalls are located at or near its western end, Sable Falls at its east end is one of the most beautiful and definitely worth a visit. Located about a mile west of Grand Marais, Sable Falls is reached by a short hike and a few hundred stairs. Sable Creek makes a 75-foot drop here in three sections, starting out wide at the top before narrowing as it flows toward Lake Superior. 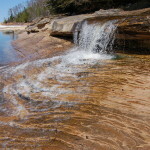 In the spring and summer months, the colors here are really something to behold as the white of the water contrasts perfectly with the green forest surroundings and tan sandstone creek bed. 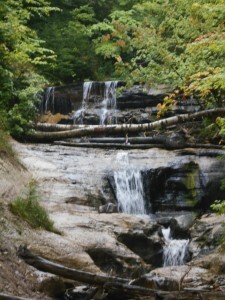 In the fall, things get even better as the leaves change and add even more vibrance to the landscape. 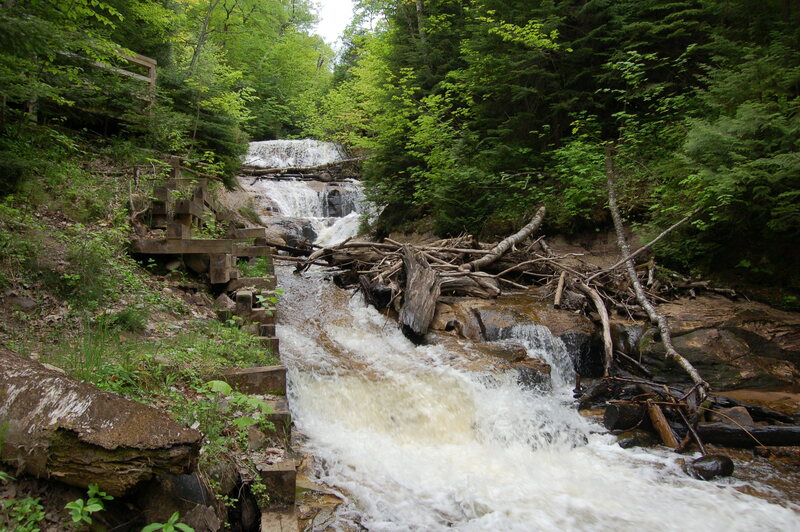 The water flow here can vary seasonally, and while in most of our visits dating back to 1993 we’ve had great luck our August 2014 visit found almost dry conditions as shown above. In the spring, snow melt makes for great conditions and roaring waters. 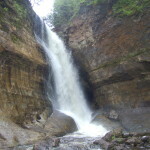 It is even possible to snowshoe or hike back to these falls in the winter for a different perspective. 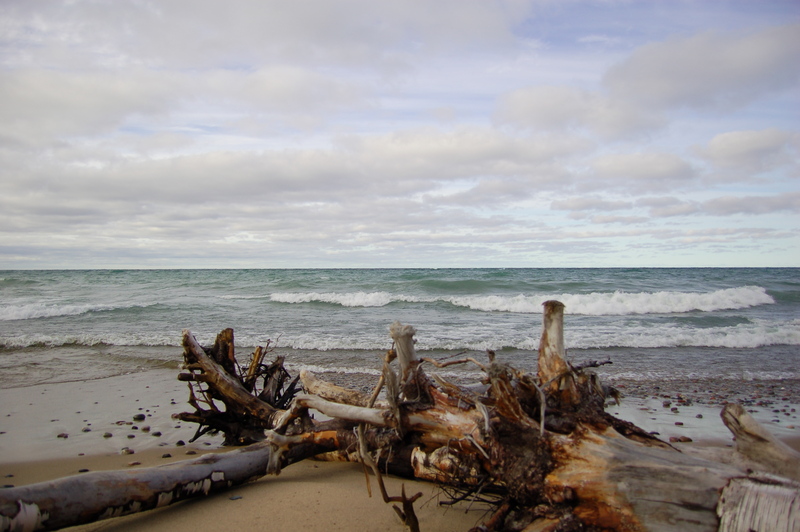 If you are so inclined, the boardwalk over the creek and the trail continues on to the lakeshore, where towering dunes and scenic views await. 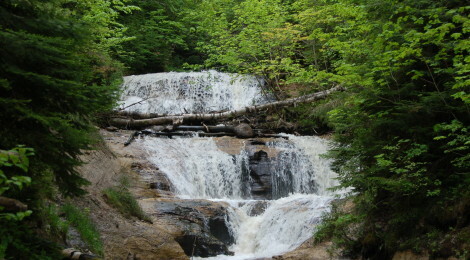 This area sees a lot less traffic than the other end of the park near Munising, so if you’re looking for a scenic place for some quiet time to just enjoy nature this is a great place to visit. Directions: From Grand Marais, head west on H-58 about a mile to the signed entrance drive and parking lot for the falls. 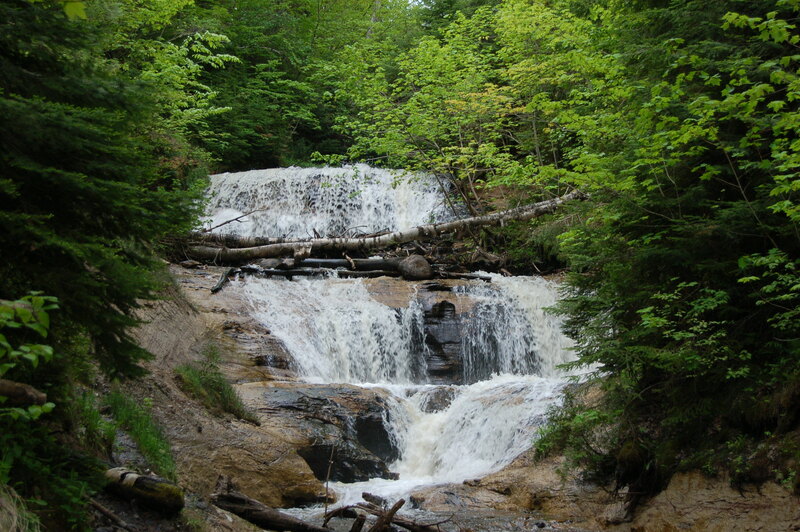 From Munising, take H-58 all the way through the National Lakeshore, and look for the entrance drive for Sable Falls on the left shortly after passing the Grand Sable Dunes. The paving of H-58 that was completed in 2010 made this drive much easier. Be prepared for: steep stairs, possible rough trail conditions or closures depending on recent weather.